The S9300 operates on the Versatile Routing Platform (VRP) operating system developed by Huawei and adopts the hardware-based forwarding and non-blocking data switching technology. 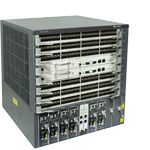 The S9300 features carrier-class reliability, line-speed forwarding capability, perfect Quality of Service (QoS) mechanism, service processing capability, and good expansibility. The S9300 provides rich enterprise network features, including firewall, Network Address Translation (NAT), network traffic analysis, IPSec VPN, and load balancing, meeting requirements of various services on enterprise networks. The S9300 is mainly used to access, converge, and transmit services on the MAN. As the access and convergence device on the MAN, the S9300 provides EPON, Fast Ethernet (FE), Gigabit Ethernet (GE), and 10GE interfacesthat transmit services at line speed.The S9300 can be applied to enterprise networks and data centers, providing high-density interfaces and rich value-added service (VAS) capabilities. The S9306 supports a maximum of six Line Processing Units (LPUs). The dimensions of the S9306 are 442 mm x 476 mm x 441.7mm (width x depth x height). Facing the chassis, the LPUs, SRUs, CMUs, and power modules are mounted from top to bottom. Ventilation and heat dissipation of the S9306 are performed from the back ofthe chassis. The handles reside on both sides of the chassis. The board cage of the S9306 provides a total of eight slots for horizontally inserted boards. The two slots in the middle are reserved for the SRUs that support 1+1 backup mode. The other six slots are reserved for the LPUs. The fan frame and air filter of the S9306 are located at the back of the chassis. Located at the bottom of the chassis, the power modules support double power supply networks for power input. The power modules can be either AC power modules or DC power modules. The DC power modules can work in 1+1 mode. The AC power modules can work in 1+1 or 2+2 mode. Located at the bottom of the chassis, the CMUs work in 1:1 backup mode. The power modules support Power over Ethernet (PoE). The PoE function supports only the AC power supply. Four AC power modules work in 3+1, 2+2, or 4+0 (not backup) mode. The S9300 provides high-density Ethernet interfaces. This section describes the the maximum interface density on the LPU and in the entire system, forwarding capability, features and reliability. Table 1 lists the types of interfaces on the boards with high interface density and describes the interface density of theboards and in the entire system. Service extensibility: The SRU of the system supports the FSUA, which can meet the requirements for service development in the future. Power supply: Currently, the maximum power supply of a power supply module is 1600 W, and 1+1 and 2+2 redundancy are supported. In the future, 4+4 redundancy will be supported. cluster switch system (CSS): In a CSS, two switches are connected through dedicated stacking cables to form a logical switch. To meet the forwarding requirement of the database and ensure the network reliability, the CSS technology is used. On the S9300, the hardware completes two-level packet replication to forward multicast at wire speed. Thatis, the SFU replicates multicast packets to the LPU, and the forwarding engineof the LPU replicates the multicast packets to its interfaces. The S9300 provides MPLS services. TheS9300, which functions as the network access device (NAD), supports Web authentication, 802.1x authentication, and MAC address authentication. The S9300 adopts adistributed structure, which guarantees the separation between the data planeand the control plane. It provides a security performance leading in the industry. Three user authentication modes: local authentication, Remote Authentication Dial in User Service (RADIUS) authentication, and Huawei Terminal Access Controller Access Control System (HWTACACS) authentication. Anti-attack features: The S9300 provides the blacklist and CAR functions to limit the packets to be sent to the CPU. Blacklist and attack trace: TheS9300filters out the traffic of users on the blacklist and displays the physical interfaces and VLAN IDs of the attackers. Whitelist: TheS9300provides a high-priority channel for the protocol packets transmitted to the CPU. The S9300 provides a powerful monitoring system. The S9300 manages and maintains the entire system by using the individual monitoring unit. The monitoring unit manages, monitors, and maintains the boards, fans, and power modules. The S9300 complies with Electro Magnetic Compatibility (EMC). The modular design of the S9300 implements EMC isolation between boards. The S9300 meets the requirements for the high reliability of carrier-class and high-end devices.The S9300 provides the following features shown in Table 3 to ensure high reliability. The boards, power modules, and fans are hot swappable. The monitoring unit is totally separated from the service system. The system can operate normally for 96 hours when a single fan fails. The MPUs work in 1+1 backup mode. The power modules work in 1+1 or 2+2 backup mode. Key components such as the clocks and management buses work in backup mode. The system can restart automatically and be recovered when abnormalities occur. The system resets a board when abnormalities occur on the board and resumes the work. The system automatically restores the interface configuration. The system provides protections against over-current and over-voltage for power modules and interfaces. The system provides protection against mis-insertion of boards. The system provides alarm prompt, alarm indication, running status query, and alarm status query. The system adopts distributed hardware-based forwarding. The control channel is separated from the service channel to provide a non-blocking control channel. The system provides fault detection for the system and boards and alarm function for indicators, and the NMS. The system supports in-service patching. The system supports version rollback. The system supports online upgrade of the BootROM. The system supports the Error Checking and Correction (ECC) Random Access Memory (RAM). The system supports hot backup of the data between the active and standby units. When the active unit fails, the standby unit automatically takes over the active unit for data transmission. This prevents data loss. The system supports the synchronization between the MPUs and LPUs. The system can automatically select and boot correct applications. The system supports the automatic upgrade and restoration of the BootROM program. The system can back up configuration files to the remote FTP server. The system can automatically select and run correct configuration files. The system provides abnormality monitoring for the system software, automatic restoration, and log record. The system provides password protection for system operations. The system provides hierarchical protection for commands through the configuration of login user levels and command levels. The system can lock the terminal through commands to prevent illegal use. The system provides operation and confirmation prompts for some commands that may degrade the system performance. The system adopts the generic integrated Network Management System platform developed by Huawei. The S9300 supports Ethernet OAM, providing point-to-point Ethernet fault management to detect faults in the first mile of the directly connected link on the user side of the Ethernet. The S9300 supports automatic neighbor discovery, link fault monitoring, remote fault notification, and remote loopback configuration defined in IEEE 802.3ah, and Connectivity Check (CC) fault detection, MAC Ping, and MAC Trace defined in IEEE 802.1ag. The S9300 supports MPLS OAM, providing fault detection and location techniques such as Ping and TraceRoute on the MPLS network. The S9300 supports 802.1ag, 802.3ah, association between the status of BFD sessions, and end-to-end OAM. The S9300 supports traffic statistics based on physical interfaces, VLAN IDs, MPLS LSPs, and ACLs. The S9300 supports different configuration methods such as end-to-end configuration, batch configuration, and configuration wizard. At the same time, it provides corresponding default configuration templates. The S9300 supports remote maintenance. The S9300 supports remote maintenance through Telnet. The S9300 supports in-service upgrade. When the system is operating normally, it can be upgraded through FTP or TFTP. In addition, with the active/standby switchover function, services are not interrupted during the upgrade. The S9300 supports hot patch. It can upgrade only the features that need to be optimized. Services are not interrupted during a patch is installed. It also supports deletion and confirmation during a patch is installed. It supports rollback of versions. When the in-service upgrade of the system software or that of a patch fails, the S9300 can return to the version before the upgrade.